I found the above photo while I was about to reformat my old memory card. This card is actually one of my favorite handmade creations, but I never got to blog about it since I forgot that I have a photo of it. What I do remember is the big wide smile I got from the recipient when she got my her card. Card: Plain white board paper that I covered with golden-yellow colored paper. The recipient’s favorite color is yellow thus the color scheme. Center Border: Martha Stewart Deep Edge Punch, Flower Bed. I then added a slim bright yellow ribbon in the center. 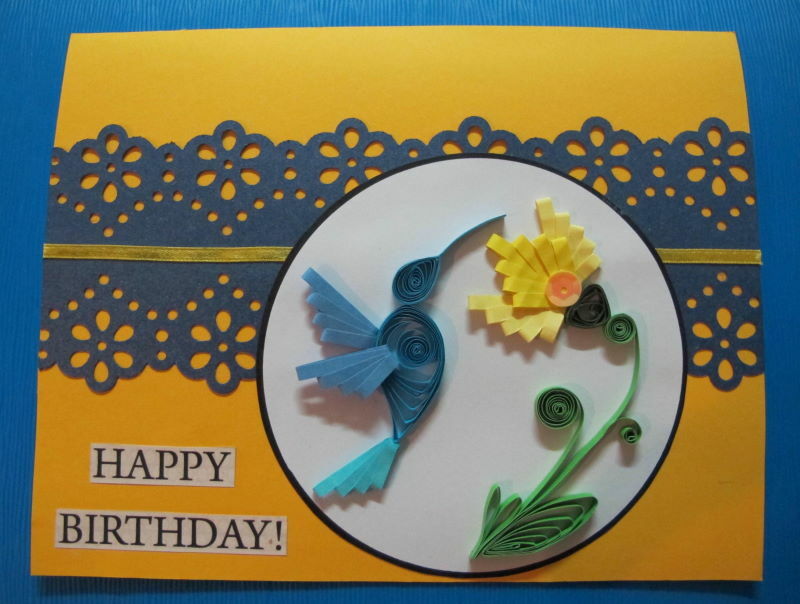 Accent: Quilled Hummingbird and Flower. I cut out a circle on a plain white vellum paper and used a Sharpie black marker to highlight its edge. This became my background for my quilled creations. I chose 3 shades of blue for my hummingbird to complement the dark blue border (and because blue is my favorite color, te he). Others would have used a quilling comb for the wings and tail, but because I didn’t have it (it’s very difficult to find quilling supplies in the Philippines), I had to use a regular comb. The yellow flower was done using the same technique. I’m not sure if it’s clear in the photo, but I used 2 shades of yellow for the petals (the darker one is at the center). A yellow sequin at the center completed my flower’s design. Sentiment: cut-outs from a wrapping paper. 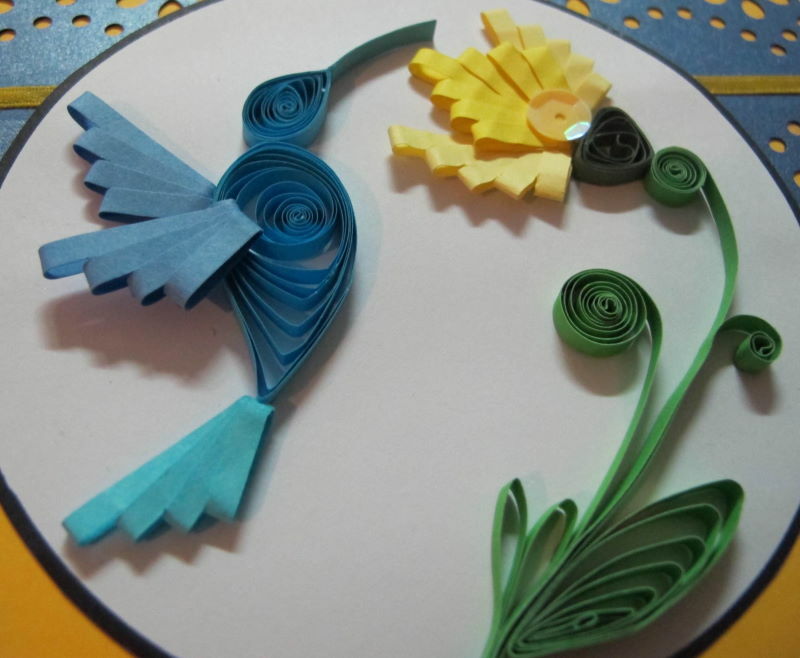 Here’s a close-up of my quilled blue hummingbird and yellow flower.